Dear readers, please give a warm welcome to Icons8 App 4.1. This new app provides a lean and minimalistic experience that makes browsing, editing, and exporting more than 14,000 icons a breeze. It resides in the menu bar and supports dragging icons to Sketch, Photoshop, Xcode, or any other software. Icons8 team has taken the Apple approach towards their product. What does that mean? The old approach (IconFinder, etc.) was to find an icon, then save, color, resize, and finally, convert it. Icons8 new approach is to find, recolor, resize, and convert it all in the App and then just drag it to Sketch or Xcode. Search icons. Each icon has about 20 tags, but you can also browse icons by categories. Customize icons: recolor, resize. All sizes up to 100 x 100 px are available for free. However, paid users can choose any size, even 4000 x 4000 px. Choose various formats: PNG, SVG, EPS, or PDF. Drag and drop to Photoshop, Xcode, Sketch, or anywhere. The new version of the App contains the world’s first icon pack for Windows 10 as well as 2,100 flat color icons. All 14,000+ icons are stored offline and available for free in PNG up to 100×100 px. Every Icons8 icon is produced by the same design team, meaning consistency, quality, and style across the board. Icons8 App is distributed under the freemium model. 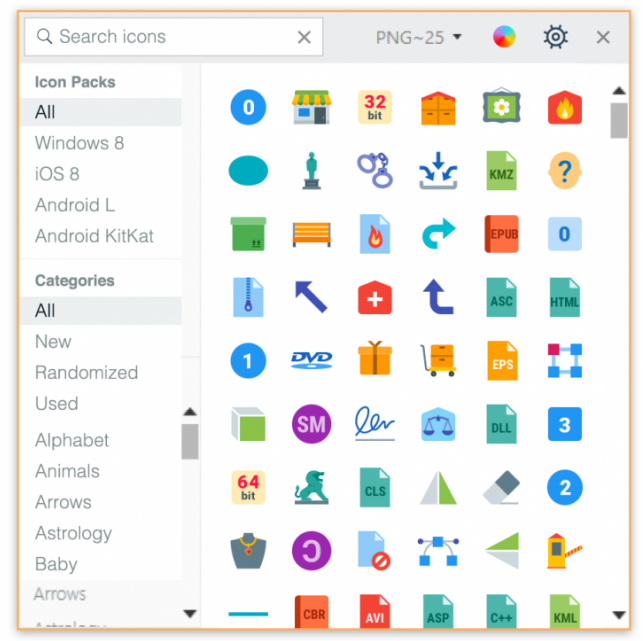 PNG icons of up to 100×100 px are free for a link. Unlocking all formats costs $199, with an additional $50/year subscription for all icons produced within a year. Icons8 promises to produce no less than 6,000 icons annually, and they’ve kept up with that promise so far.